In light of recent events in the international banking system and government legislations, the idea of someone confiscating your gold is about as likely as pigs flying, no offence to pigs. People forget that during the 1930's the USD was backed by gold and the government needed gold to expand their balance sheet. Also there were no "Registered Retirement" accounts back then and many people stashed gold coins away for safety, not bank deposits, so there was not much liquidity in the banking system. 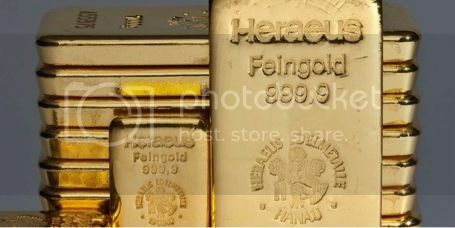 HERAEUS Bullion Bars NOW AVAILABLE! Heraeus is a globally active precious metal and technology Group based in Hanau, near Frankfurt, and with deep roots in Germany. The company has been family-owned for more than 160 years. Our business groups cover precious metals, materials and technologies, sensors, biomaterials, medical, dental, and pharmaceutical products, quartz glass, and specialty light sources. Currently Heraeus holds more than 5,900 patents. Over 400 R&D employees in 25 development centers around the world are producing the innovations that are the hallmark of our company. In 2011, on the strength of more than 13,300 employees in more than 120 companies, Heraeus generated product revenues of €4.8 billion and precious metals trading revenue of €21.3 billion. (Reuters) In a radical departure from previous aid packages, euro zone finance ministers want Cyprus savers to forfeit a portion of their deposits in return for a 10 billion euro ($13 billion) bailout for the island, which has been financially crippled by its exposure to neighboring Greece. In fact, according to the bank's Chief Metals Economist, Peter Richardson, "The reasons for owning gold may be evolving."